Collins Booksellers - College Student Mental Health by Susan R. Jones & Sherry K. Watt, 9781119359395. Buy this book online. In recent years, there has been heightened attention paid to the mental health needs of college students, the range and scope of these issues, and the challenges related to providing mental health services. Counseling center data, changing legal mandates and anecdotal reports from senior practitioners all point to the growing complexity of managing these issues. This volume examines clinical issues for student affairs professionals beyond the counseling center– addressing how campuses can be prepared for and respond to mental health issues. It helps readers cultivate a community-centered understanding of and sense of shared responsibility for promoting mental health, knowledge about best practices for service provision, and strategies for dealing with mental health issues pertaining to specific student populations and issues within the environment. 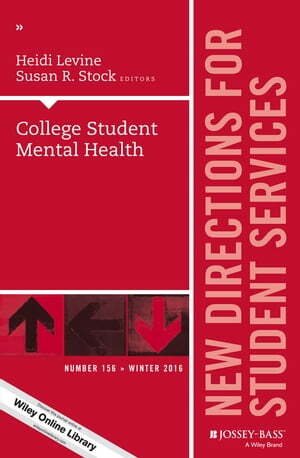 Future directions of mental health on campuses. This is the 156th volume of this Jossey-Bass higher education quarterly series. An indispensable resource for vice presidents of student affairs, deans of students, student counselors, and other student services professionals, New Directions for Student Services offers guidelines and programs for aiding students in their total development: emotional, social, physical, and intellectual.